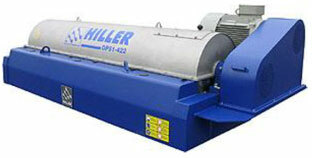 Hiller Separation & Process US offers the complete range of DecaPress DP Model horizontal decanter centrifuges incorporating decades of mechanical knowledge and process experience to provide an effective, low-maintenance solution for continuous liquid-solids separation, liquid clarifying and / or solids dewatering with advanced mechanical features and superior processing performance. The DP Decanter Centrifuges are very versatile and capable of adapting to a wide variety of industrial applications and capacities. The machines are easy to adjust over a wide range of process conditions and require little operator attention with automated controls. Replaceable wear liners at points in contact with solids for easy on site replacement and servicing. Standard available automation package features Hiller back-drive control plus PLC with color HMI and VFD motor controls. Custom automation and programming of additional process controls is available. Complete custom skid packages with common structural steel skid with pumps, sludge conveyor, hydraulic unit, and control panel with all components premounted, wired, and piped for turnkey operation and portability.